This quick tour will guide you through the first steps on using PyTango. Before you begin there are some fundamental TANGO concepts you should be aware of. Tango consists basically of a set of devices running somewhere on the network. A device is identified by a unique case insensitive name in the format <domain>/<family>/<member>. Examples: LAB-01/PowerSupply/01 , ID21/OpticsHutch/energy . Each device has a series of attributes, pipes, properties and commands. An attribute is identified by a name in a device. It has a value that can be read. Some attributes can also be changed (read-write attributes). Each attribute has a well known, fixed data type. A pipe is a kind of attribute. Unlike attributes, the pipe data type is strucured (in the sence of C struct) and it is dynamic. A property is identified by a name in a device. Usually, devices properties are used to provide a way to configure a device. A command is also identified by a name. A command may or not receive a parameter and may or not return a value when it is executed. Any device has at least a State and Status attributes and State, Status and Init commands. Reading the State or Status attributes has the same effect as executing the State or Status commands. Each device as an associated TANGO Class. Most of the times the TANGO class has the same name as the object oriented programming class which implements it but that is not mandatory. TANGO devices live inside a operating system process called TANGO Device Server. This server acts as a container of devices. A device server can host multiple devices of multiple TANGO classes. Devices are, therefore, only accessible when the corresponding TANGO Device Server is running. This chapter assumes you have already installed PyTango. To explore PyTango you should have a running Tango system. If you are working in a facility/institute that uses Tango, this has probably already been prepared for you. You need to ask your facility/institute tango contact for the TANGO_HOST variable where Tango system is running. If you are working in an isolate machine you first need to make sure the Tango system is installed and running (see tango how to). if you receive a message saying that the server is already running, it just means that somebody has already started the test server so you don’t need to do anything. The device is in RUNNING state. >>> # the result of reading an attribute is a DeviceAttribute python object. This is just the tip of the iceberg. Check the DeviceProxy for the complete API. PyTango used to come with an integrated IPython based console called ITango, now moved to a separate project. It provides helpers to simplify console usage. You can use this console instead of the traditional python console. Be aware, though, that many of the tricks you can do in an ITango console cannot be done in a python program. Since PyTango 8.1 it has become much easier to program a Tango device server. PyTango provides some helpers that allow developers to simplify the programming of a Tango device server. The Tango Class name of your device (example: PowerSupply ). In our example we will use the same name as the python class name. """Demo power supply tango device server"""
dtype_out=bool, doc_out="True if ramping went well, "
Check the high level server API for the complete reference API. The write a server how to can help as well. 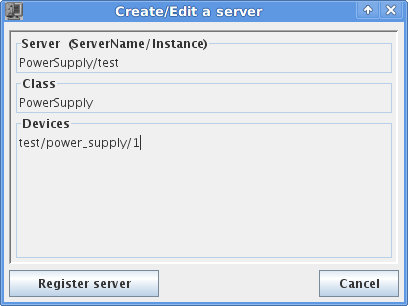 In this example, the name of the server and the name of the tango class are the same: PowerSupply . This pattern is enforced by the run_server() method. However, it is possible to run several tango classes in the same server. In this case, the server name would typically be the name of server file. See the run() function for further information.